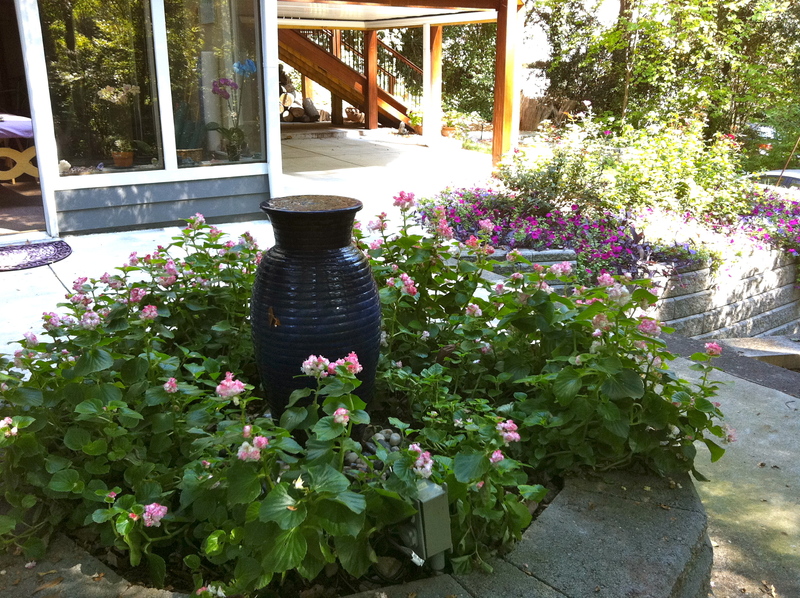 Yesterday in qi gong class, we stopped at one point and I asked everyone to feel the chi of my apple blossom double begonias around the fountain where we had been practicing. This photo is the point of view of one of my qi gong students – i.e., what he or she would see while practicing our exercises. When we develop our capacity of awareness with subtle things, however, we can increase our overall intelligence about the big things. Such as, I was in London in July 2005. I was supposed to go into the city on the subway one Thursday morning, but even the day before and the days before that, I did not have a good feeling about it and I cancelled all my appointments. I was out for a walk when terrorists blew up the subway. I was not in the subway. One of the women I studied medical intuition from liked to practice by going to casinos. She would challenge herself by being in a noisy, crowded place and practice feeling the chi of the slot machines. Yesterday, I asked everybody what the chi of the flowers felt like. Several people said the energy felt really clean. I pointed out that they had a pulse. Somebody else agreed, but pointed out the pulse was not the same as a heart beat. Another person said they could feel the energy field of the flowers quite clearly. If you were more sensitive, what would you notice? Would you begin to pay attention to the subtle signals of your body, such as that you are full when you are eating and you don’t need any more food? Would you be better at your interpersonal relationships, and know when to stop talking and listen? For me, being sensitive is an essential skill for being a healer. This morning, I was working on one of my clients who has had itchy, dry eyes. Her eyes had considerably improved, and then she developed problems with her ovaries and came down with strep throat after being in the hospital. Her eye problems got much worse during the time she was sick. “When I do a medical intuitive reading on you, I am seeing little bumps behind your eyelids,” I told her this morning. This was a new phenomenon that I had not seen in her before. “I went to the eye doctor yesterday, and he told me I had rosacea behind the eyelids,” she confirmed to me. I could feel the irritation in her eyes as I began my Reiki treatment. I could feel where the irritation was worse around the corners of her eyes, and I could tell when her discomfort was abating. She felt much better when she left my office. Life isn’t always black and white. Sometimes it is the subtle shifts that all the difference.